Talisman: The Dungeon adds a new Region to the game for heroes to explore. A custom-fitted map board and over 100 new cards bring this subterranean realm vividly to life. Five brand-new characters – the formidable Gladiator, noble Amazon, dashing Swashbuckler, enigmatic Gypsy, and sagacious Philosopher – are each brought to life with a superbly detailed plastic miniature, and offer fantastic new playing experiences. In a nutshell, this expansion provides a lot of “more of the same”. It doesn’t really introduce any new mechanics that have a substantial change from the base game. It does include some new rewards and monsters which I feel are a bit bigger than what we are used to seeing in the base game, but it primarily adds only familiar elements. THIS IS NOT A BAD THING. Overall I would say this is a great first expansion to buy. It deepens the replay value of the base game without cluttering things with too many new mechanics. I have always said, “if I love the base game, I will love expansions that provide more of the same”. The Dungeon does just that! Although you can end up picking up lots of loot, the end boss is very difficult to challenge. We all ended up backing out of the dungeon to go about our own ways. Interesting twists and the torch card is very beneficial to have. Many of us preferred to stick to the library and kitchen, but monsters were too tough. Don’t go in until your characters have built up both defenses and offenses. The guard was perhaps the one space that will continue to give you trouble as people keep landing on it. Artwork is great to look at and expansion lines up nicely with board. We had the unfortunate play where a dungeon entrance card was placed on the dungeon entrance space. Not much benefit to see a second door appear in the same space. 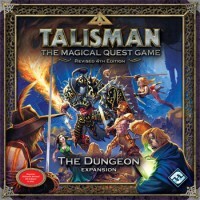 Add a Review for "Talisman: The Dungeon"